This largish fungus, known infamously and justifiably as the Deathcap, accounts for more than 90% of fungus-related poisoning deaths in Europe. Amanita phalloides is quite a common species in most parts of Britain and Ireland. The Deathcap occurs throughout Britain and Ireland and can also be found in other mainland European countries, where it occurs most commonly at low altitudes. 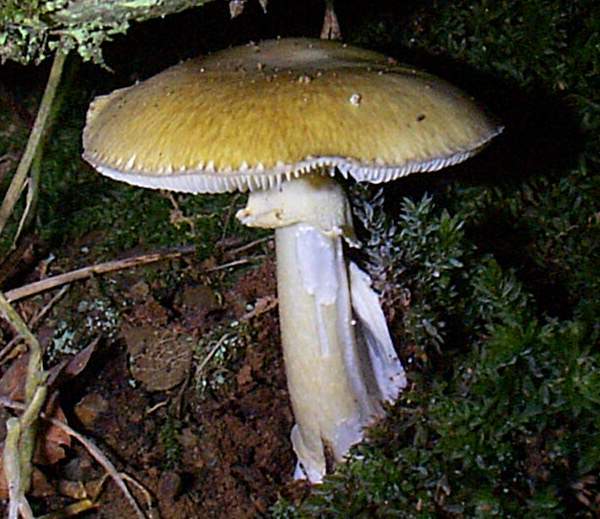 Amanita phalloides is found also in northern Africa and in many parts of Asia, although other similar species occur there and so some reoports of Deathcaps may be the result of misidentification. In the USA Amanita phalloides is an introduced species; it was probably brought in from Europe along with tree imports. 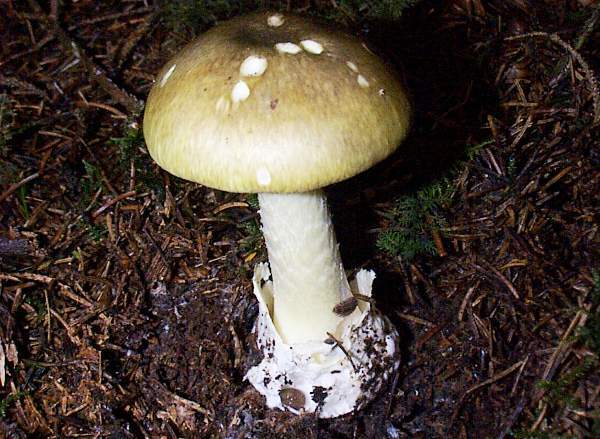 Other parts of the world, including Australia and South America, now contain Amanita phalloides as a result of timber or plant imports in the past. Above: although Deathcaps are mycorrhizal fungi and therefore effectively tethered to tree roots, they are able to produce arcs and even fairy rings. Amanita phalloides f. alba Britzelm is the white form of the Deathcap; but, as white specimens commonly occur alongside the more common form, most experts agree that this is merely a colour variant of Amanita phalloides. 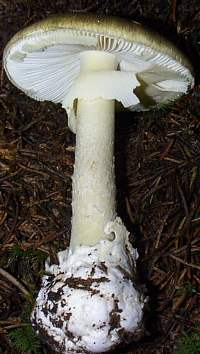 Amanita verna var. tarda Trimbach is also considered by many to be a synonym for A. phalloides rather than a variety of the Spring Amanita or Spring Destroying Angel, Amanita verna (Bull. : Fr.) Lam. The phallic shape of a young Deathcap fruitbody, emerging from its volva, gave rise to its specific epithet phalloides. 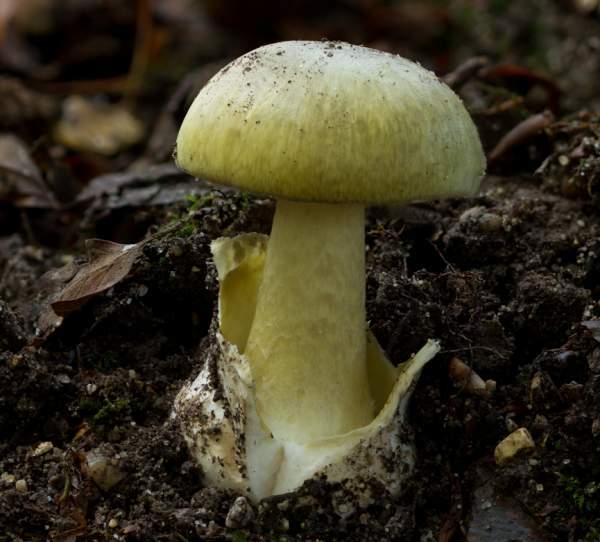 The common name is sometimes written as Death Cap rather than Deathcap, and in the USA (to where this species was almost certainly introduced from Europe) this toxic toadstool is commonly referred to as the Death Cup. 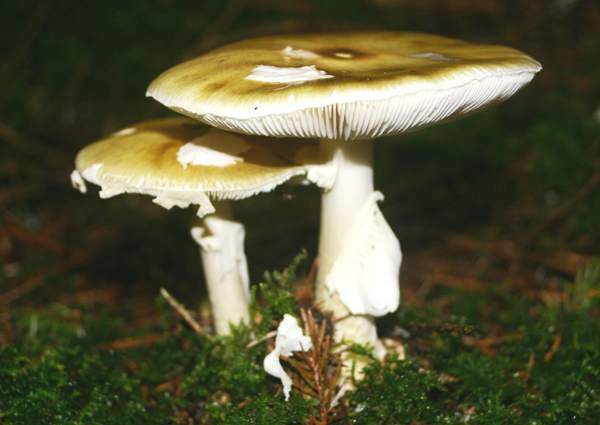 Above: In dry weather fragments of the universal veil may adhere to caps of Amanita phalloides, usually as large creamy-white patches rather than in regularly scattered 'spots' as with Fly Agarics. 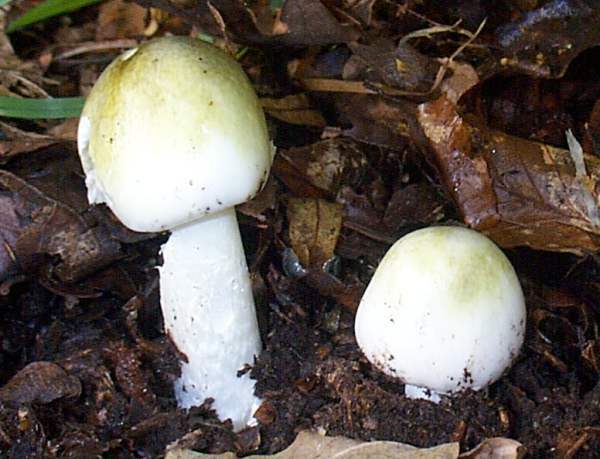 Several toxins have been isolated from this poisonous toadstool, but the constituent that damages the liver and kidneys of anyone that eats the Deathcap is known as α-amanitin. Its potency is not reduced by either freezing or cooking the fungi before eating them. Contained not only in certain amanitas but also in some fungi from the genera Galerina, Lepiota and Conocybe, amatoxins initially cause gastrointestinal disorders with symptoms such as diarrhea, nausea and stomach pains occurring within five to twelve hours. Cruelly, the systems usually fade away for several hours or even a day or two, tricking the victim into thinking that they are recovering. When in due course the symptoms return with a vengeance, it may be too late: kidney and liver damage are already well underway. Without treatment, coma and eventual death are almost inevitable. Often, people hospitalised late into an amotoxin poisoning episode can only be saved by major surgery and a liver transplant, and even then recovery is a precarious, painful and protracted process. Anyone gathering mushrooms to cook and eat needs to be able to identify this poisonous amanita fungus and to distinguish between a young Deathcap and an edible Agaricus mushroom such as the Wood Mushroom, Agaricus sylvicola, which occurs in the same habitat as Amanita phalloides, or the Field Mushroom, Agaricus campestris, which is often found in fields bordered by deciduous trees with which Amanita phalloides can be associated. Deathcaps at the button stage could also be mistaken for edible puffballs such as Lycoperdon perlatum, the Common Puffball, or Lycoperdon pyriforme, the Stump Puffball; however, if the fruitbody is cut in half longitudinally the volva of Amanita phalloides, the Deathcap, would immediately become apparent. 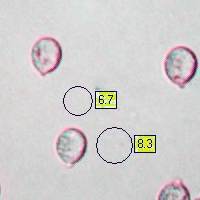 Although old Deathcap fruitbodies have an unpleasant smell, young ones at the button stage are virtually odourless. It is reported that they taste quite pleasant (but don't check this out, please! ), and that can only add to the risk of them being included in a meal. Half a mature cap is reportedly a lethal dose for an adult, and reports indicate that currently there is still a 10 to 15% mortality rate even after being hospitalised and receiving best-practice medical treatment. One piece of advice that I received many years ago has helped me to enjoy eating wild mushrooms while avoiding the risks of poisoning by deadly amanita toadstools: before even bothering to learn about the key identification features of the world's best edible fungi - and there are plenty of them - take the trouble and make the time to learn to identify, without any shadow of doubt, the two most deadly fungi on earth: Amanita visrosa and it close allies that are all commonly referred to as the Destroying Angels, and Amanita phalloides, variously known as the Death Cap, Deathcap or Death Cup. In the meantime, 'never eat a Amanita' seems to be a pretty good maxim, and especially when applied to white members of the Amanita genus. 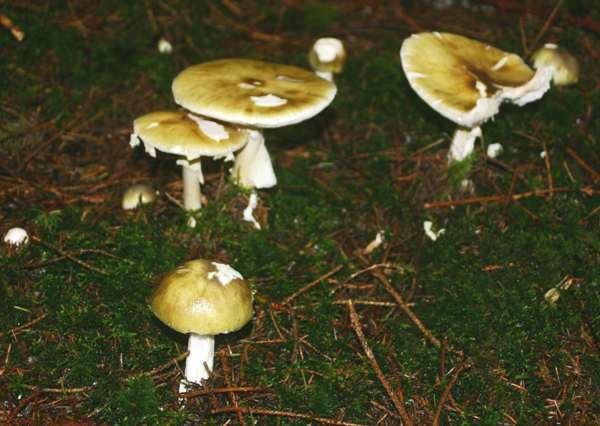 There are many fictional accounts of Deathcap poisoning, and history is full of dubious reports of murder by mushrooms where Amanita phalloides was implicated. Agrippina, wife of Roman Emperor Claudius, is believed to have plotted to poison her husband by including the deadly Amanita phalloides in a meal of Caesar's Mushrooms, Amanita caesarea. Claudius certainly died of poisoning, and it may well have been Deathcaps that were used, either in a mushroom meal or as an extract added to his meal of Caesar's Mushrooms. It is very probable that the death in Vienna, in 1740, of Holy Roman Emperor Charles VI was the result of poisoning by Deathcap mushrooms. Many more people have died not at the hand of a murderer but because they have mistaken Deathcaps for other edible mushroom species. Animal feeding behaviour has generally been used as the first indication of the edibility of plants and fungi. This can be a treacherous guide, however, as rabbits and squirrels appear to be unaffected by Amanita phalloides and many other fungi that can seriously harm or even kill people. The Deathcap, Amanita phalloides, was known by the ancient Greeks and Romans to be a deadly poison. It has been a favourite weapon of poisoners down the centuries, and even nowadays it is still the cause of many tragic and painful deaths every year. Colours vary with location and even from sample to sample, but the most common form of this fungus has a pale yellow-green or olive cap. There is, however, an all-white form of Amanita phalloides that is very similar in appearance to the Destroying Angel, Amanita virosa. Young Deathcap specimens are sometimes collected in mistake for edible Agaricus mushrooms, with disastrous consequences. 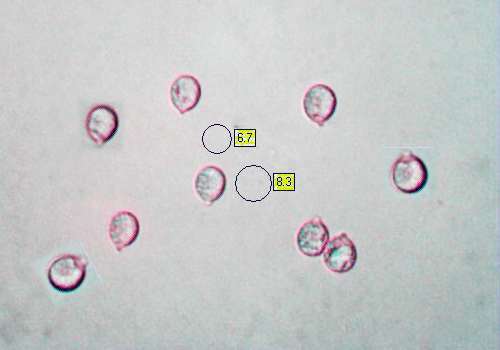 5 - 15cm diameter; almost white when immature, then yellow, bronze or olive, usually a little darker in the centre (occasionally deep grass green shading towards black at the centre); soon losing all fragments of the universal veil; initially egg-shaped, but flattening at maturity. The cap, which is not striate at the margin, tends to crack at the edges when very old. As they decay, Amanita phalloides fungi give off a very unpleasant smell. Initially the gills are pure white, but they turn cream, sometimes with a slight pinkish tinge, as the fruit body ages. Stem height 7 - 15cm; off-white, with zig-zag mottling somewhat paler than the cap colour. Amanita phalloides usually retain their fragile, pendant ring through to maturity. 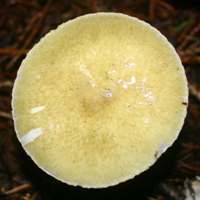 The swollen base is surrounded by a large white, sack-like volva that is often tinged green inside. Ellipsoidal to subglobose, smooth, 7.5-10 x 6-7µm; inamyloid. Not distinctive when young, but old specimens have a most unpleasant sickly sweet smell. Do not attempt to taste this deadly poisonous species. Mycorhizal with hardwood trees, especially oaks, and occasionally with softwoods. 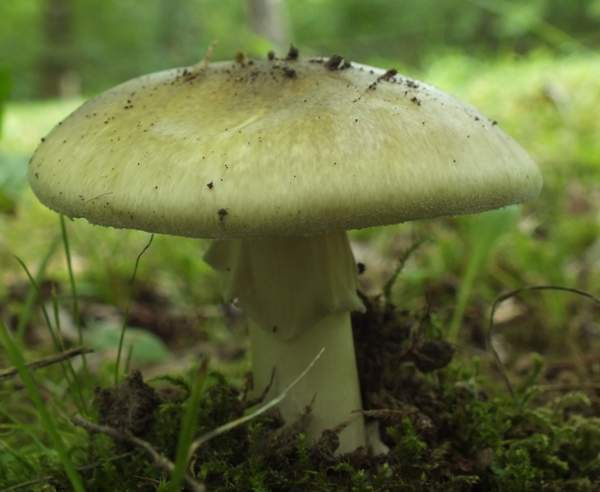 Amanita citrina (False Deathcap) generally has brownish-cream veil fragments on the cap, and a volval rim around its base rather than an open sack-like volva. Agaricus campestris and other Agaricus mushrooms do not have volvae; also, the gills of immature Amanita phalloides fungi are not grey or pinky-brown as is the case with young Agaricus mushrooms. This page includes a picture kindly contributed by David Kelly.